The Aionach is in the grip of bitter turmoil. The death of one man has triggered a chain of events that will precipitate the bloody culmination of centuries of hatred. 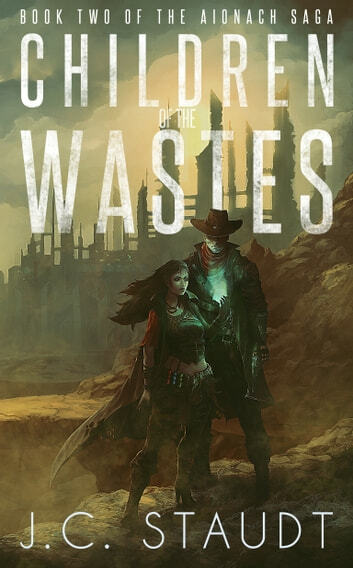 Lokes and Weaver, deadeye and sand-sorceress, have discovered an ancient key that will lead them on a search for truth, while the order of cultists protecting that truth sees their long-preserved code begin to come apart at the seams. Among the remnants of the vast desert city of Belmond, Pilot Wax and his Scarred Comrades still hold sway over the north. But a young exile with an astounding gift gathers influence in the south, and the days of peace are numbered. Master-king Tycho Montari and his thriving nation of nomad slavers are fighting a war on two fronts: one versus the trade empire which has defiled the lands of their ancestors; the other to enslave the scuttling murrhods who dwell beneath the planet's surface. 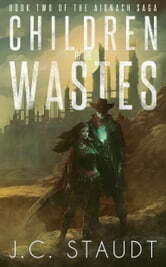 Children of the Wastes is the second volume in The Aionach Saga, a dark, epic tale of wasteland adventure set in a desolate fantasy world.